March Guild Meeting is this evening! The March 2017 Guild Meeting is this evening starting at 6:30 PM. In addition to our regular topics, Karla will be talking about capturing swarms and how to do splits. See you there! Just a reminder that we will not be having a regular Guild meeting this month. Instead, the steering committee will be meeting to organize the meeting topics and speakers for the new year. We will resume our regular meetings next month on February 1st. If you are interested in getting into beekeeping, the February meeting is the one to attend! We will be talking about starting up you apiary for the new season. 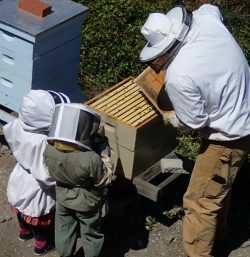 The exact meeting agenda is still to be set, but will likely include lots of information for newcomers and for current beekeepers coming out of the winter season! See you next month! December 2016 Guild Meeting is Tomorrow! The last guild meeting of 2016 is tomorrow, Wednesday, 7 December. Instead of our regular meeting, we will be celebrating another successful year of bee stewardship with a potluck and social time. Bring something to eat and drink, and have a good time with fellow beekeepers. Same time, same place – see you there! Our November Guild Meeting is tomorrow at 6:30. We’ll be talking about making sure your girls are ready for winter, and what to watch for now that the rains are upon us. See you there!